From our Beaded Drop Collection: Sparkling Beaded Fringe trim in translucent teal (almost a peacock) blue faceted teardrop beads with seed beads in crystal clear and frosted rich blue. This is a high quality, very full beaded fringe with exceptional detail and craftsmanship. The longer beaded stands are 1" long, not including the pale blue satin ribbon. Perfect for apparel or home decor. From our Beaded Drop Collection: If you are looking for a soft sage green, this gorgeous Beaded Fringe trim is probably it. 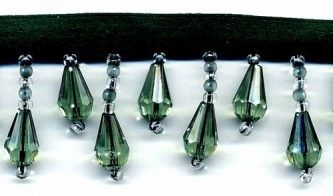 The colors are translucent pale sage green faceted teardrop beads with seed beads in clear sage green and frosted sage green. A very nice "neutral" sage. This is a high quality, very full beaded fringe with exceptional detail and craftsmanship. 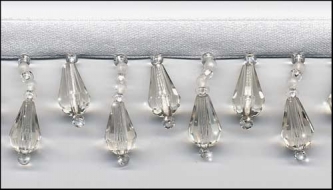 The longer beaded stands are 1" long, not including the ivory satin ribbon. Stunning! Perfect for apparel or home decor. 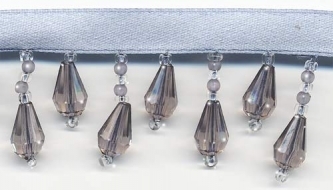 From our Beaded Drop Collection: An opulent Beaded Fringe trim in dazzling translucent dark "rich as velvet" rose faceted teardrop beads with seed beads in crystal clear and frosted rose. This is a high quality, very full beaded fringe with exceptional detail and craftsmanship. 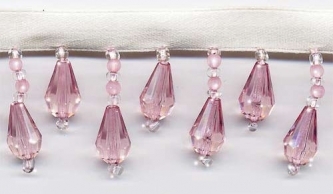 The longer beaded stands are 1" long, not including the deep rose satin ribbon. A really beautiful beaded fringe. Perfect for apparel or home decor. 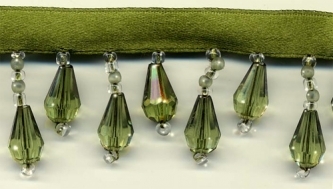 From our Beaded Drop Collection: A striking Beaded Fringe trim in extremely pale and barely-there "vintage bottle green"translucent faceted teardrop beads with seed beads in crystal clear and frosted clear. To picture this color, think of old glass that has a slightly greenish tint in it. This trim is truly beautiful, and very unique in color. This is a high quality, very full beaded fringe with exceptional detail and craftsmanship. 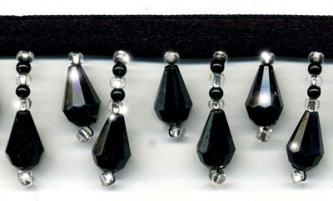 The longer beaded stands are 1" long, not including the ivory satin ribbon. Luminescent! Perfect for apparel or home decor.